VAPAE is committed to community engagement and dedicated to building bridges between outstanding UCLA artist educators and the surrounding Los Angeles community. In response to pressing needs in our local schools, VAPAE’s Afterschool & Arts Enrichment Programs offer students in the Los Angeles area supportive and constructive out-of-school arts activities. These programs provide  K-12 students with the tools they need to develop as artists and productive community members while supporting their  social-emotional development and positive relationships with adults and peers. Participants find inspiration in their everyday surroundings, and gain a more open view of what art can be through weekly artistic experiences guided by VAPAE-trained Teaching Artists. All program leaders are current or former VAPAE participants, and experienced artist educators. Studio Sessions at Emerson provides young adults the tools and support they need in order to grow as artists and creative human beings. Students connect their life experiences with an arts practice in a supportive, constructive environment. These Studio Sessions inspire students to seek new perspectives of their world and a better understanding of themselves. Young adults at Emerson Community Charter Middle School engage with a wide array of media including painting, drawing, bookmaking, printmaking, textile art, and more. By providing an afterschool arts program focused on photo narratives, Venice High School students explore the medium and technical aspects of photography while simultaneously developing digital visuals that utilize digital applications, analog, art surrounding a subjective narrative theme. This year, students explored identity as a launching point to explore their school, family and community at-large. An innovative afterschool arts program open to all UCLA Community School families interested in expressing themselves through art. Through a welcoming, creative and fun space to make art, share family and cultural traditions, MASA is an arts program that provides creative artists from different generations the opportunity to evolve as creative human-beings as they bond as artists. Students and their parents intertwine their life experiences with an arts practice in a supportive, constructive environment. This year students explored the artistic and cultural traditions involved in the Dia de los Muertos celebration through altar making and other arts and social activities. MASA explored the idea of sanctuary; can culturally significant board-games like Loteria help our communities become stronger? What consists of a sanctuary? Where do we find sanctuary? Other topics of exploration were mixed fabric media, ceramics, and tapestries. VAPAE launched its first ever Saturday Community Arts Program at the Esteban E. Torres High School Campus in partnership with the East Los Angeles Performing Arts Magnet. Originally modeled, designed and developed at UCLA Community School. VAPAE was delighted to replicate the successes of our previous MASA program with new families attending the LA Philharmonic’s Youth Orchestra Los Angeles (YOLA) Program at the Torres campus. The Multigenerational After School Arts (MASA) Program welcomed new students and family members to learn, create, and bond as artists. Can the Arts connect to scientific inquiry, tasks, and tools; Can it function as a solution to long term applications and challenges of travel? Two VAPAE Teaching Artists led 10 weekly sessions; projects included multidisciplinary arts lessons that explored intersections between visual arts and science, freeform sculpture, and art as equity. 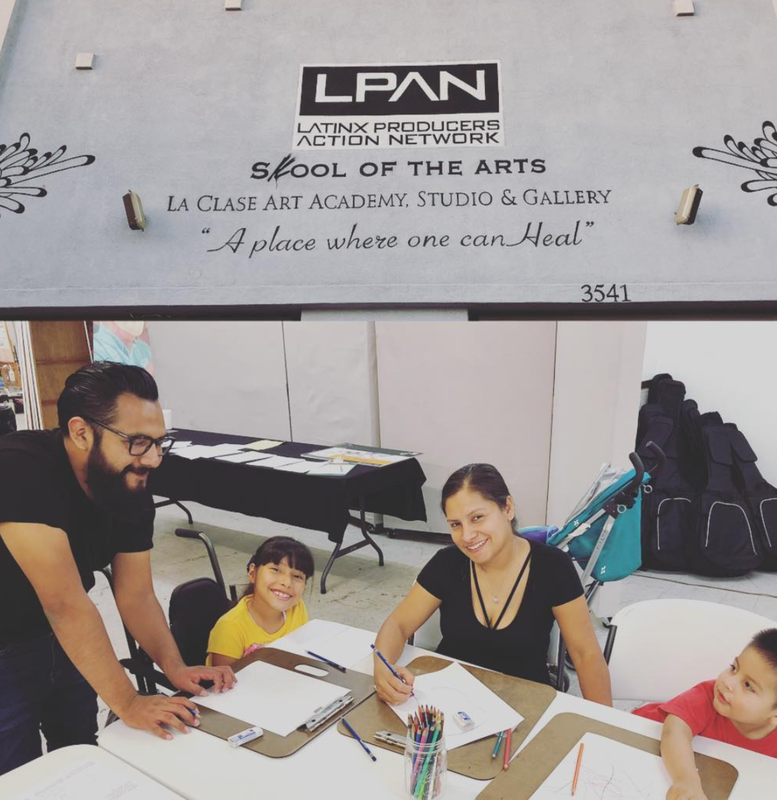 The community partnership between Las Fotos Project and VAPAE allows Teaching Artists to fully experience how arts based organizations create and sustain powerful, long lasting impact in our communities. Based in Lincoln Heights, Las Fotos Project hosted VAPAE alumna Isabella Granados throughout 12 weeks. Las Fotos Project was founded in 2010 by Los Angeles-based photographer Eric V. Ibarra after seeing a need for teenage girls throughout Los Angeles to have a skill that could help build their confidence and self-esteem. In March of 2011, Las Fotos Project became a project of Community Partners, a 501(c)3 organization which accelerates ideas into action to advance the public good. Las Fotos Project has since worked with girls throughout Southern California, and has developed partnership with national and international nonprofit organizations and schools to expand the movement of inspiring teenage girls through photography and self-expression. Our current focus is on the Central, South, and East Los Angeles regions of Los Angeles. The Mann UCLA Community School is the newest LAUSD campus to become a UCLA partner school. Throughout the Summer 2018, 6th and 7th graders were inspired to explore concepts of identity and community through the lens of cameras, engaging with the themes of perception and perspective. By utilizing digital cameras and the body as a subject, students were asked to photograph new ways of seeing their world. By photographing their families, school and neighborhoods, the students learned to trust their personal and creative outlooks; improved understanding of different communities; embraced new artistic vocabulary, while learning how they are uniquely equipped to engage and develop as creative beings. As an extension of our commitment to community engagement, VAPAE placed one Teaching Artist at LPAN for the fall quarter. Throughout 10 weeks, Emmanuel Galvez and LPAN’s Executive Director, Fabian Debora, co-led the intergenerational art workshop titled, Convivir/To Live with one Another . Through this partnership, VAPAE’s Teaching Artists have the unique opportunity to learn and expand their teaching abilities, while directly impacting our communities. Latino Producers Action Network (LPAN) is a 501(c) 3 non-profit, dedicated to the development, production, promotion, preservation and distribution of multicultural theatre, art, music, and fi lm in order to create cultural awareness and alleviate racial tension and discrimination in the community. Can the Arts provide relevance to scientific inquiry, tasks, and tools; Can it function as a solution to long term applications and challenges of travel and movement? Two UCLA/VAPAE Teaching Artists will lead 18 weekly sessions; Design and Media Arts major, and World Arts and Cultures are the Teaching Artists majors. Weekly projects will include Multidisciplinary Arts lessons that explore: Intersections between Visual Arts and Science, Art as Coding, Movement and Design, and Art as Equity. The UCLA VAPAE Studio Sessions at St. Sophia afterschool program provides 6th-8th graders with the tools and support they need to grow as artists and creative human beings. 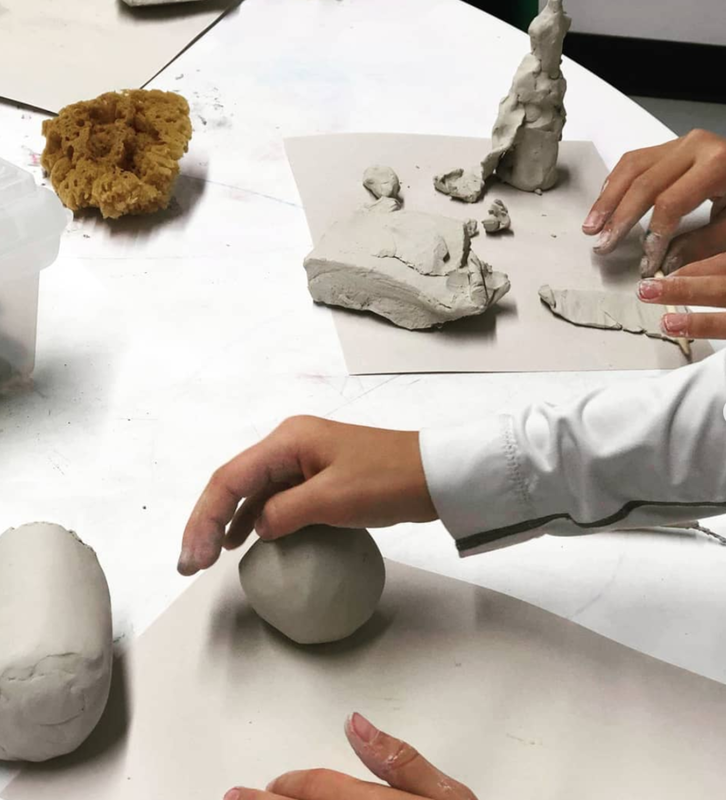 Students learn to connect their life experiences with an arts practice in a supportive, constructive environment, while exploring themes of identity and self-expression. Students explore and experiment with a variety of media to learn more about themselves and what they want to communicate through their art. By encouraging students to find their own visual language, gather inspiration from their everyday surroundings, collaborate with one another and understand the larger world of art and creativity, VAPAE seeks to inspire a creative arts practice that will continue throughout the lives of the participants. Studio Sessions at Emerson provides young adults the tools and support they need in order to grow as artists and creative human beings. Students intertwine their life experiences with an arts practice in a supportive, constructive environment. These Studio Sessions inspire students to gain a new perspective of their world and a better understanding of themselves. Young adults at Emerson Community Charter Middle School engage with a wide array of media including painting, drawing, bookmaking, printmaking, collage, and more. By providing an afterschool arts program focused on photo narratives, Venice High School students explore the medium and technical aspects of photography while simultaneously developing digital visuals that utilize digital applications, analog, art surrounding a subjective narrative theme. An afterschool arts program open to all UCS 6th grade students and all UCS parents interested in expressing themselves through art. VAPAE provides a welcome, creative, and fun space in order to make art, share our family and cultural traditions, and tell our stories. MASA is an innovative arts program that provides creative artists from different generations the opportunity to evolve as creative human beings as they bond as artists. 6th grade students and their parents intertwine their life experiences with an arts practice in a supportive, constructive environment. This fall students are exploring the artistic and cultural traditions involved in the Dia de los Muertos celebration through altar making and other arts and social activities. MASA families focus on the idea of sanctuary: what do our communities look like if we recreate them with boxes and little wooden people? What consists of a sanctuary? Where do we find sanctuary? Other topics of exploration are positive and negative space, mixed fabric media, tapestries, and weavings. ACT TWO is a 10 week performing arts program for formerly incarcerated and system-impacted youth from throughout Los Angeles. With support from the California Arts Council's Re-Entry Through the Arts grant, and led by our team of UCLA faculty, student mentors, and VAPAE teaching artists, ACT TWO is a platform for young people of our community who have been impacted by the criminal justice system to use the performing arts - dance, theater, poetry/spoken word, music and more - to tell their own original stories onstage. Over the course of the 10 weeks, participants from our community partner sites - Aviva Family and Children's Services, Youth Build Hollywood Charter School/Home Sweet Home, and Free LA High School/ the Youth Justice Coalition - will work together in a collaborative creative process to create a fully staged devised theatre performance to be performed at UCLA in March of 2018. Dance at Emerson offers students a safe, welcoming, and fun space to build new friendships, learn the skills necessary to develop as dance artists, and receive the support they need to grow as creative and confident human beings. This program is open to any student with any level of dance experience, who is committed and passionate about dancing. Dancers will train in a variety of hip-hop, house, and contemporary dance styles while also learning new choreography and creating their own dances. Every week, participants will learn new steps and work towards creating dance routines! Visual Arts @ Coeur d'Alene provides the tools and support students need in order to grow as artists and creative human beings. Students intertwine their life experiences with an arts practice in a supportive, constructive environment. These Visual Arts sessions inspire students to gain a new perspective of their world and a better understanding of themselves. Students at Coeur d’Alene Avenue Elementary will engage with a wide array of media including painting, drawing, bookmaking, collage, and more. ACT ONE is a partnership between Aviva Children and Family Services, the UCLA Visual and Performing Arts Education (VAPAE) program and Agency Arts offering arts based diversion programming and UCLA student mentorship to formerly incarcerated and system impacted Los Angeles youth. The fall program, starting October 5, consists of 10 workshops to build performance skills and will end with an informal work in progress sharing and art demonstration for an audience of family and community members. Teaching Artists: Bianette Linares, Jai Williams, and Gabriel Gutierrez.